When I first thought this could possibly be an interesting thing to do in August of 2010 it seemed to me that perhaps 12 to 15 trips with some skilled searchers might be all that would be required to find Bill. Or hikers would come across him in short order. People just don’t stay lost in Joshua Tree. I based this upon my knowledge of the case and also my familiarity with Joshua Tree. Now, after 44 or so trips, I see I have raised wrongness to new heights. The last few trips I’ve made, JT39 through JT43, have been “fill in the blanks” trips, looking at low probability locations that have never been checked. Frankly I had run out of high probability locations long ago, as well as any brilliant ideas. Bill just didn’t seem to be where we, or anyone else, thought he should be. Although the past few trips were a waste of time from a searching viewpoint, it did give me a lot of “alone time” to work the problem. I had the sense we should by now have enough “knowns” to reduce the unknowns to a relatively small area. After all, we knew a great many places where Bill was most definitely not. But how to put it all together in a cohesive manner? With Mike’s new cell phone info it occurred to me it might be possible to perform something I called an “exclusion analysis”. The idea was to graphically lay out the entire geographical area and rule out areas that had already been searched or weren’t possible for other reasons. Sort of a cross between a Venn Diagram and a map. The hope was after performing this exercise there might be only a few small areas left. The image below (click on it to make with the bigness) shows the overall playing field northerly of Quail Mountain. The black lines show the GPS tracks from the original search for Bill back in 2010. 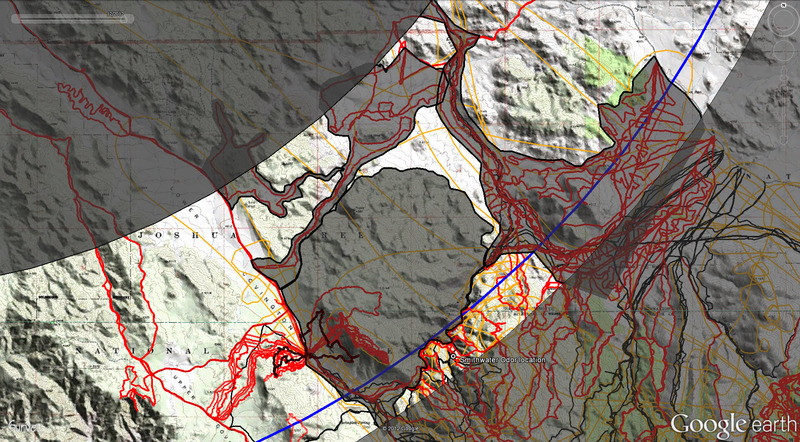 The red lines show the tracks made by myself and numerous others since then. 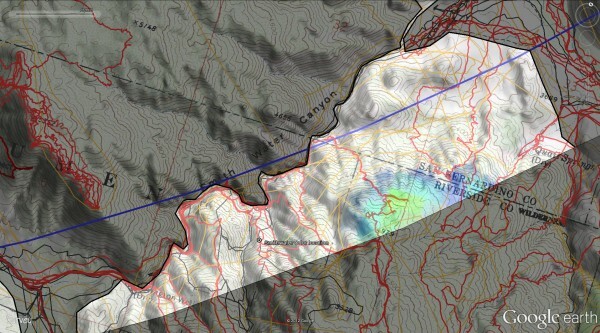 The blue line is the 10.6 mile radius from Verizon’s Serin Drive cell tower. Overall area northerly of Quail Mountain. Blue line is 10.6 mile Serin cell tower radius. Let’s first deal with the cell phone data. As mentioned, it shouldn’t be possible for Bill’s cell phone to have been much beyond 10.6 miles due to the way Verizon measures distance. Any measurement error is going to be limited to small measurement errors in the phone hardware itself. Suffice to say this puts a hard outer limit of around 11.1 miles on it. Coming up with an inner limit is a little more tricky. It’s possible for a phone to be closer to a tower than the tower thinks if the phone is bouncing its signal off a rock face behind it, increasing the path length to the tower. Probably the most outlandishly worst case might be a phone at about 8 miles from the tower bouncing its signal off a rock face 1 mile behind it, making the tower think it was about 10 miles away. In reality that’s probably way too far a bounce for the types of rocks found in Joshua Tree, but let’s go with it for now. Areas excluded because they are less than 8 miles or greater than 11.1 miles from the Serin Drive cell tower. OK, now let’s look at areas we can exclude for other reasons. The most obvious reason to eliminate areas is due to previous searching or the fact they receive considerable foot traffic. Certainly this applies to the flat area between Park Road and Quail Spring, including Samuelson’s Rocks. Also lumped into this category would be Quail Wash and its surrounding area draining northerly out of the park. Geography also allows for exclusion. Smith Water Canyon creates a massive east-west divide. It’s highly unlikely anyone would descend into Smith Water Canyon then attempt to ascend the north slopes. 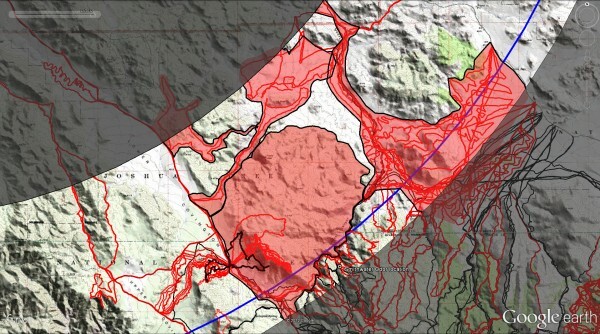 So areas northerly of Smith Water Canyon can be struck from consideration. Below is what bringing those areas into the mix looks like. There are still a lot of uncolored areas, but some are along roads, are open and exposed or are otherwise nonsensical. Areas that can be excluded due to foot traffic, previous searching or topography. As another point of reference I want to overlay the helicopter search tracks on top of this. When the support helicopters weren’t tasked with inserting or extracting search teams, they performed aerial searches. I’ve added their tracks in orange on the image below. Helicopter GPS search tracks added in orange. The fact that in the 2 1/2 years since Bill went missing no backcountry hiker has ever come across him tells us something. It says Bill must be in some remote area where few, if any, people go. And we also know that thanks to Mike Melson’s field measurements Bill’s cell phone ping probably originated fairly close to the 10.6 mile radius, in an area with potential cell coverage to the Serin Drive tower (Although at the 10.6 mile radius, the Upper and Lower Covington Flats areas don’t have access to the Serin cell tower so we really don’t have to consider them). One area stands out like a remote, treacherous sore thumb: The southerly slopes of Smith Water Canyon. Here’s a detail of it. Close up of Smith Water Canyon. Note that the westerly parts of Smith Water Canyon have experienced a fair amount of search coverage. 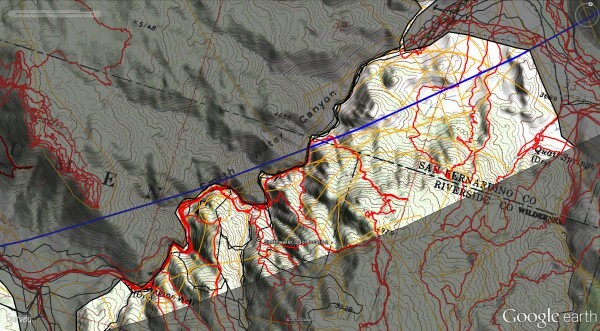 However all the upper slopes, which have the cell coverage, are outside the hard limit of 11.1 miles. This isn’t the case for the easterly parts of the canyon. The only searching has been a few trips since the original search. There are also a couple of substantial holes in the helicopter coverage of that area. A final piece of the puzzle falls into place when we overlay the Serin cell tower coverage onto this map. After all, you can’t have a cell ping unless there’s at least the chance of a connection to the tower. 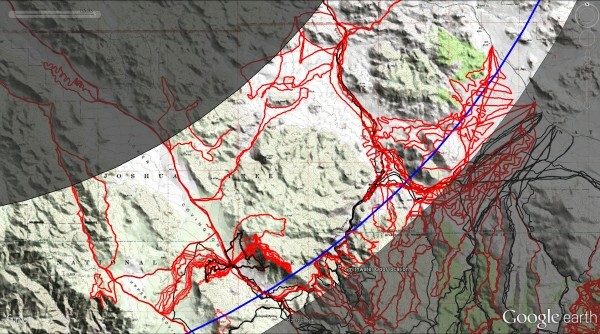 The image below shows the coverage in this area with the yellow color being the strongest and blue the weakest. Note that some of the coverage is on the very steep and rugged northerly facing slopes. Smith Water Canyon Serin tower cell phone coverage areas. Yellow is strongest, blue is weakest. Well that’s all fine and good, you might be muttering. But why in hell would someone bound for Quail Mountain end up on the southerly slopes of Smith Water Canyon at its far easterly end? Turns out there’s a plausible way for this to occur, a way that encompasses all clues known to date. Bill made a few cell phone calls that morning on his way to Joshua Tree that Thursday morning, and then presumably turned off his phone to save the batteries. I say this because there is no stated record of any cell phone pings headed toward the park beyond his calls. Bill arrived rather late in the morning at the Juniper Flats trailhead and began his hike toward Quail Mountain along the standard approach. It’s believed he was carrying three bottles of water, not a considerable amount given the temperatures at the time. Bill crossed Juniper Flat and started ascending the southerly face of Quail Mountain, perhaps accidently dropping a bandanna. He would have probably reached the summit ridge a bit westerly of the actual Quail Mountain summit. Given the temperature, the climb and the distance he might have had a situation at that point, but a very minor one. He would have burned through all or most of his water supply. Hmmm….What to do? We know that Bill knew about Smith Water Canyon, as it was listed as a possible place to visit on an itinerary found in his condo. And if you know anything about Smith Water you know there’s at least some water there all year round. It was only about two miles away while his vehicle parked at the trailhead was more like 6 miles. The view toward Smith Water from the Quail Mountain ridge provides an illusion of not appearing too bad. And Bill was a tough hiker (I was told he was in Recon in the Vietnam War) and could use a map and compass. A clever idea would be to abandon Quail Mountain, divert over to Smith Water Canyon, descend and get some water, head westerly out of the canyon to rejoin the California Riding and Hiking Trail which heads directly back to his vehicle. It would make for a longer day but would be a good adventure. Looks perfectly doable on a map. And there IS water in Smith Water. There’s plenty of cell coverage on top of the ridge he was on, but why make a call? There’s no emergency. He’ll be back a bit later that he originally thought but no reason to worry anyone. What unsettles me a bit is that this is just exactly the sort of thing I would do, and I’ve been known to be too clever for my own good on many occasions. The most obvious direct route to Smith Water is to the northwest, toward a saddle on the horizon and Bill starts that way. Now somewhere between Quail Ridge and that saddle Bill possibly experienced some sort of injury. A simple stumble or fall would be all it takes to twist or even break an ankle. Bill had no hiking poles with him, so it would be easy to do. Well below Quail Ridge, far off route with little or no water, this has now become a serious situation. Bill probably turned on his phone, but now down in the canyons northerly of Quail Mountain there’s no reception. Given this scenario, it would be tempting to abandon Smith Water and start descending the drainage canyons down to the flats near Samuelson’s Rocks and the paved Park Road beyond. This appears deceptively easy from the high ground between Quail and Smith Water but in fact the terrain is quite rough. After some unknown time pursuing this option it becomes clear to Bill he won’t have the time or reserve to make it all the way down out of the canyons. His only other option at this point would be to resume an attempt on Smith Water. 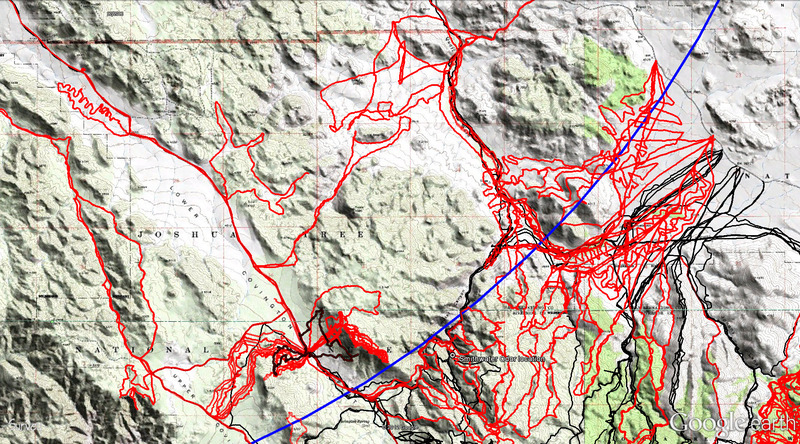 But his down-canyon detour has taken him away from his original course and he works out a new path to Smith Water, this time coming in to it more towards its easterly end. The terrain is pretty tough here, cross-cutting ravines, but there’s really no choice. It has to be done. Bill was described to me by a couple of folks as, “A bull of a man”, and someone who would not stop until he dropped. 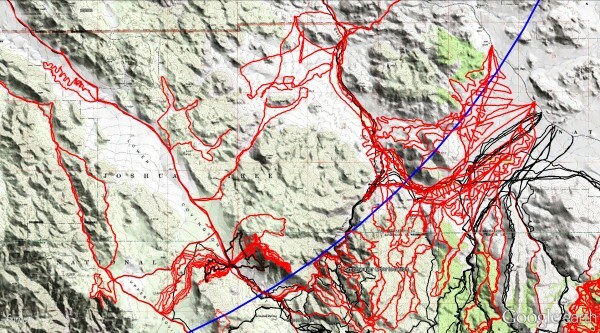 Depending upon the extent of injury it may well have taken until Saturday night to reach the edge of Smith Water Canyon. Can’t really say. What we do know is that around 6:35 AM on Sunday morning, a cell ping was received from the Serin Drive tower at a distance consistent with the southerly slopes of Smith Water Canyon at its easterly end. And having been in those areas a couple of times myself, I’d say it’s highly unlikely anyone severely dehydrated, with a leg injury and no hiking poles, could make it safely down the descent. It’s always struck me as a little odd that in all the searching that’s been done by all the searchers, no one’s ever come across any of Bill’s empty water bottles. He could have just dropped them by the wayside or placed the empties on top of a rock as markers. It makes no sense to carry along empty bottles….unless one has plans to refill them. And Smith Water is the only place to do that. I am quite confident Bill was never lost. Bill was very familiar with Joshua Tree, and from the upper areas of Quail Mountain the entire vicinity is quite visible. And Bill never exhibited any typical lost-person behavior, such as always heading downhill. If he had, he would have been found by now. I think Bill was smart, fit, capable and had a plan. But it was a plan that no one else could ever guess about. And Bill could have no way of knowing how bad the descent into Smith Water can be. I think Bill is going to be eventually found on the southerly slopes of Smith Water Canyon, or just above them, towards the easterly portion of the canyon. It will be in rocky terrain probably with visibility towards the sky limited. In fact, I think it will be somewhere in the area shown below in green (or close nearby), an area we’ll be visiting very soon. Potential Smith Water Canyon search area shown in green. Looking across Smith Water Canyon to southerly slopes. Previous tracks in red and black. 10.6 mile radius in light blue and 11.1 mile radius in yellow. Bottle noted was found during JT42. I do need to add a couple of closing things. First, I may be completely wrong about this. I have, after all, been wrong 44 times. And I can provide you signed affidavits from those who know me that I am often full of crap. This could well be one of those times. But as someone who has rolled all sort of possibilities around in my mind for over two years, this one feels right. Second, I am not recommending anyone who doesn’t know exactly what they are doing wander out into this area. I’ve been there a few times and will tell you it is nasty, loose, treacherous terrain. If that isn’t enough there are rattlesnakes and occasional mountain lions. It can hurt the unwary and kill the unlucky. No really….I’m not joking.